On September 14, 2011, a team of astronomers revealed that the Milky Way's spiral arms could have been generated after two collisions with SagDEG over the past billion years. As the galaxies collide, model simulations indicate that stars are sent streaming in long loops from both galaxies. These loops continue to swell with stars and are gradually tugged outward by the Milky Way’s rotation into ringed arms. For the arms to form, SagDEG needed a substantial amount of dark matter that is mostly stripped off (80 to 90 percent) by the collision along with stars of normal matter (UC Irvine news release; Purcell et al, 2011; Tammy Plotner, Universe Today, September 15, 2011; Charles M. Choi, MSNBC News, September 14, 2011; and Justin Mullins, New Scientist, September 14, 2011). within another 10 million years or so (more). of the Milky Way (more). Also known as the Sagittarius Dwarf Spheroidal Galaxy, SagDEG can be found in (18:55.1-30:29, ICRS 2000) Constellation Sagittarius, the Archer. One of nine known nearby, dwarf spheroidal companion galaxies of the Milky Way, parts of SagDEG are so close that their stars are found within the outermost regions of the Milky Way's spiral disk, as close to the galactic center as the Solar System. Despite its proximity to the Milky Way, it was not discovered until 1994 because it was hidden from observers in the Solar System by the Milky Way's central region which presents a dense mask of foreground stars and dust that further obscures detection of SagDEG's extremely low surface brightness (Ibata et al, 1995 and 1994). Astronomers, however, found that some of the stars observed in the line-of-sight from the Solar System were not found to be moving as they should if they are located in the central regions of the Milky Way, and so they were gradually apportioned to a small, previously unseen galaxy. Larger and jumbo contoured images. 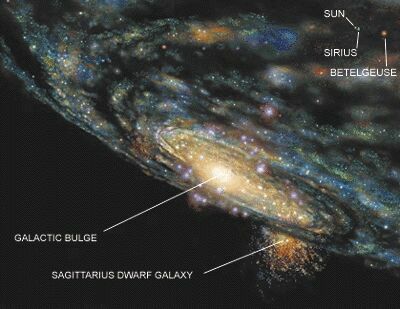 At first, many astronomers thought that the SagDEG had already reached an advanced state of destruction, so that a large part of its original matter was already mixed with that of the Milky Way. Subsequent observations indicated, however, that substantial parts of SagDEG still exist in a severely distorted fashion. Moving in a roughly polar orbit around the Milky Way as close as 50,000 ly from its galactic center, SagDEG comes far too close to the Milky Way for the dwarf to remain intact from the resulting gravitational tides. Although it may have begun as a ball of stars before falling towards the Milky Way, SagDEG is now being torn apart by immense tidal forces over hundreds of millions of years. Numerical simulations suggest that stars ripped out from the dwarf would be spread out in long streamers along its path, which were subsequently detected. of Milky Way's spiral disk (source). Astronomers has been eager to view directly the destruction of the dwarf galaxy (as it is engulfed by the much larger Milky Way -- to study in detail and at first hand the mechanism governing the formation of large galaxies. 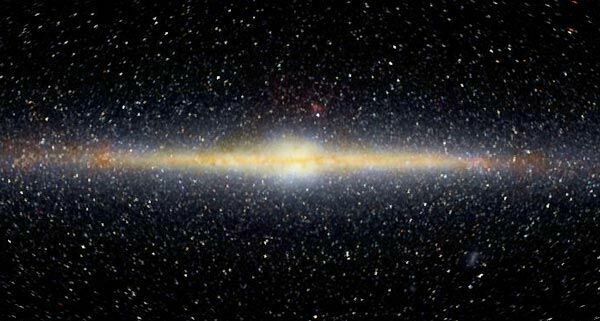 They also hoped to find stars that were originally part of the dwarf galaxy and that would now be strewn along its entire orbit, thereby forming two streams that encircle the Milky Way. Unfortunately, these stellar streams would be extremely diffuse, so diffuse that they might be completely indistinguishable from Milky Way stars, even at short distances from the center of Sagittarius itself (Ibata et al, 1996; Christophe Alard, 1996; and Johnston et al, 1995). Larger and similar simulation images. 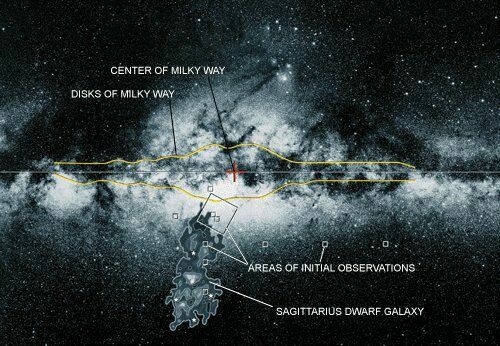 In 1996, a team of astronomers found a stream of stars that were apparently stripped from SagDEG by the Milky Way as a "tidal trail" (Mateo et al, 1996). Extending to the southwest, it can be traced out to 34 degrees from the center of Sagittarius. Although theoretical models predicted the symmetric presence of another stream, extending to the northwest, that could be so long as to completely encircle the Milky Way, this stream was more difficult to find because it would cross the disk of the Milky Way and so be obscured by the dense stars, gas, and dust of the Galactic Center. Four years later, another team of astronomers using the 2.5-meter Isaac Newton Telescope at Roque de los Muchachos Observatory on La Palma (and relying on evidence supplied by their own dynamical models of Sagittarius and on preliminary results from the international Sloan Digital Sky Survey team) announced that they had found an excess of young stars belonging to a stellar system located at 183,000 ly (56,000 pc) from the center of the Milky Way. Its position in the sky indicates that it probably contains stars belonging to the northwest stream that was stripped out to 60 degrees from Sagittarius (equivalent to 212,000 ly or 65,000 pc when measured along the orbit of Sagittarius) from the center of SagDEG. 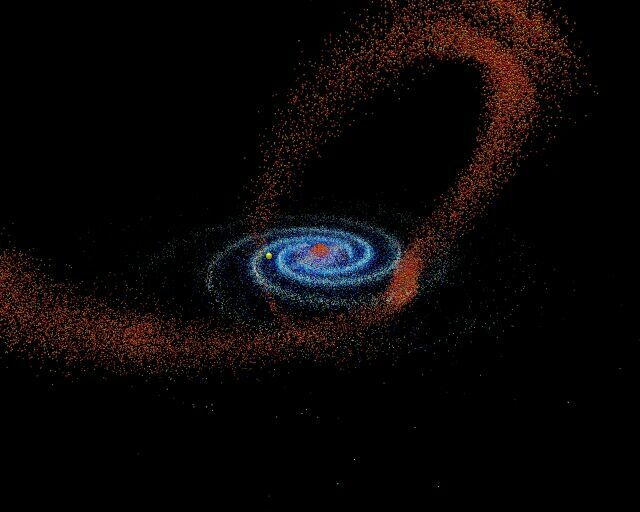 These remnants are the furthest from the centre of a progenitor detected and confirm that SagDEG has formed an arc that completely surrounds the Milky Way, just as predicted by theoretical models (more from: IAC press release; Martínez-Delgado et al, 2003, 2002, and 2001; and Dolm-Palmer et al, 2001). Studies of highly evolved, Carbon stars in the Milky Way's halo and of SagDEG's halo streams suggest they are of comparable age and so imply that the Milky Way and Sag DEG have been a strongly interacting system for most of their existence (Ibata et al, 2001). depicted by the yellow dot (more). 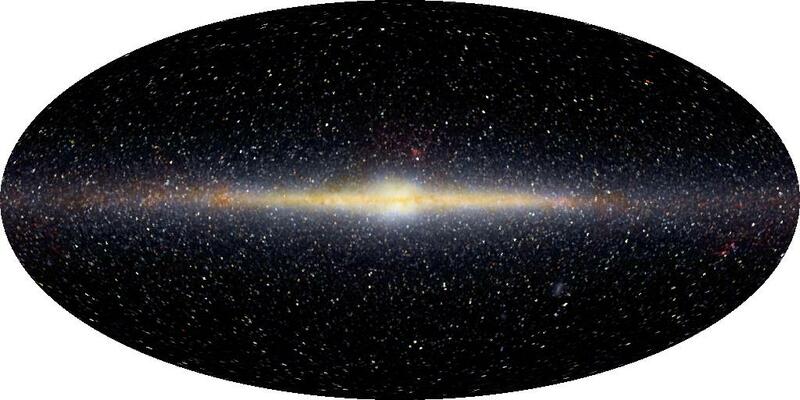 Another team of astronomers (including Rosemary Wyse, Nicholas Suntzeff, Rodrigo Ibata, Gerard Gilmore, and Mike Irwin) estimated in 1998 that SagDEG orbits the Milky Way within less than a billion years. Because SagDEG must have already passed the dense central region of the Milky Way at least about ten times, the dwarf should have been more disrupted that is observed. However, astronomers now suspect that SagDEG has more dark matter than it was originally suspected to have to hold onto so many of its stars for so long inspite of the Milky Way's strong gravitional pull (press release). Much of its current state of tidal disruption may actually have come from its last pass through the Milky Way, rather than from the current one (Velazquez and White, 1998). 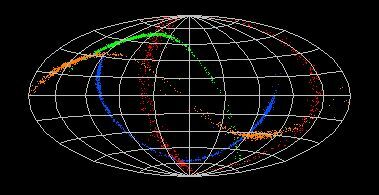 In 2003, some astronomers modeling SagDEG's movements with a full-sky map of red (M) giant stars attributed to the galaxy that were detected through the Two-Micron All Sky Survey (2MASS) speculated that it was once pulled through the Milky Way's disk very close to Sol's current location (Majewski et al, 2003; and Law et al, 2003). star streams (more discussion and simulations). 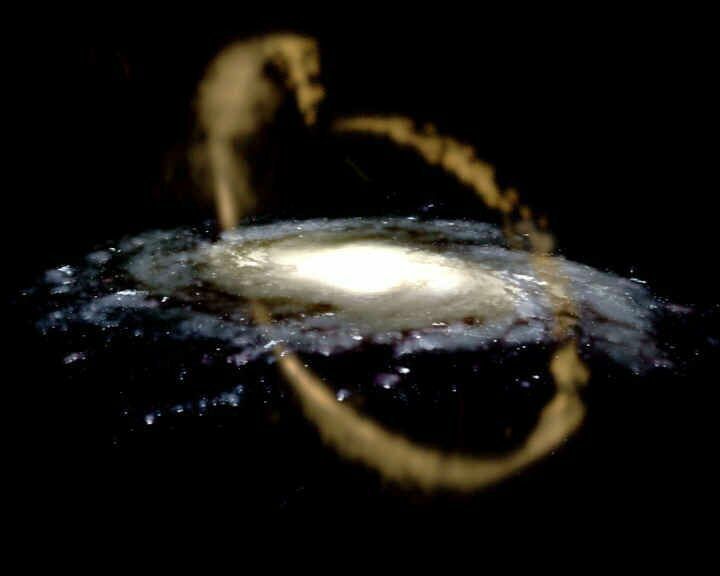 In return, the close proximity of SagDEG has also affected the Milky Way's spiral disk, warping it like an old-fashioned phonograph record left out in the hot sun. Like a sun-baked record spinning on a turntable, the Milky Way spins around with similarly floppy and wobbly gyrations every 250 million or so years (Hallum and Byrd, 1994; and Frank J. Kerr, 1957). According to Jeremy Bailin, an astronomy graduate student at the University of Arizona in Tucson, SagDEG has the right orbital characteristics to have caused the warp. SagDEG is located only a third as far from the center of the Milky Way as the Magellanic Clouds and its orbital motion is linked to the rotation of the Milky Way's disk. Bailin's analysis of the galactic warp is based on angular momentum -- a measure of how much a system is spinning or rotating. When two spinning objects spinning collide, their angular momentum is combined. When Bailin deduced the angular momentum of the warped portion of the Milky Way's disk and compared that measure with SagDEG's angular momentum, he found that, within the margins of measurement error, the two angular momenta are very similar in strength and direction. 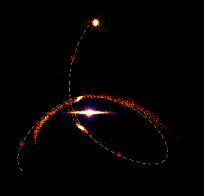 As such a great similarity in the angular momentum of the two bodies are not likely to be a coincidence, Bailin's findings appear to provide strong circumstantial evidence that the interaction of SagDEG with the Milky Way disk created its warp. 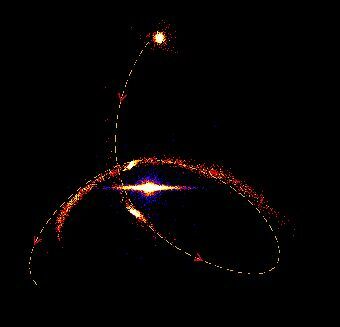 With continued spinning, the warp should eventually disappear after a few hundred million years to a few billion years unless another dwarf galaxy like Sagittarius collides with the right orbital motion to warp the Milky Way's disk again (Jeremy Bailin, 2003; and Charles Liu, 2003). (An image of a warp in spiral galaxy ESO 510-13, that also may have developed from a galactic collision, is available at Astronomy Picture of the Day). Magellanic Cloud (more at APOD). 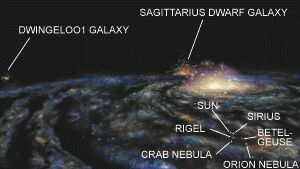 SagDEG has roughly one-tenth of the Milky Way's diameter but less than one-thousandth of its visible mass, perhaps only 1/10,000 of its mass ( , 2003). It is nearly as close to the center of the Milky Way as the Solar System. 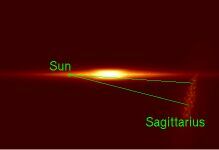 Much of SagDEG appears to be located at only 49,000 to 78,000 light-years (ly) -- or 15 to 24,000 parsecs (pc) -- from the Solar System on the far side of the Galactic Center (at about 52,000 ly or 16,000 pc from the Center), moving in a roughly polar orbit above and below the galactic disk at about 50,000 ly from the galactic center. It is the nearest known satellite of the Milky Way. Aside from older and more metal-poor, RR Lyrae variable stars, the bulk of the galaxy's stars were recently found to be relatively metal-rich and determined to be around 10 to 14 billion years old (Fahlman et al, 1996). Some useful designations include: SDG, SGR dwarf elliptical, SGR dwarf galaxy, SGR dwarf spheroidal galaxy, Sagittarius dwarf galaxy, SGR I dwarf. Globular cluster M54 coincides with one of the galaxy's two bright knots, and is also receding at about thesame velocity as SagDEG. It may also be located around the same distance away (about 80,000 ly or 24,500 pc) and is probably the first extragalactic globular ever discovered (by Charles Messier in 1778). When SagDEG be further disrupted after the current close encounter with the Milky Way, M54 and at least three other globulars of this companion galaxy (Arp 2, Terzan 7 and Terzan 8, which are all much fainter than M54) may become the most easily observable "fossil remnants," while the galaxy's other stars will be spread over the Milky Way's galactic halo, or escape as intergalactic travelers. The globulars themselves may also be captured and become members of the Milky Way's halo, as there is already one Milky Way globular cluster which is suspected to have been captured from SagDEG (see Palomar 12) (Bellazzini et al, 2003 and 2002; Martínez-Delgado et al, 2002; Fahlman et al, 1996; and Ibata et al, 1995). Born of the Magellanic Clouds? 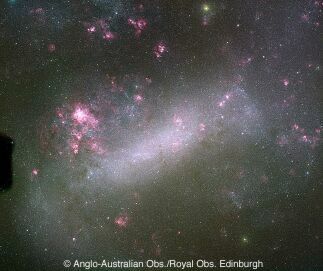 Since the discovery of SagDEG, researchers have noticed that some of its stars are strikingly similar to stars in the Large Magellanic Cloud (LMC), another nearby satellite galaxy that is located slightly farther out from the Milky Way. Recently, a team led by Patrick Cseresnjes of the Paris Observatory found strong similarities in a certain class of highly evolved, old stars seen in both of these satellite galaxies. The evidence suggests that both satellites may have a common galactic ancestor, a larger galaxy that was ripped apart to form both the Large Magellanic Cloud and the closer SagDEG. RR Lyrae variable stars (about which enough about their unique features is known to separate them from the intervening thicket of Milky Way stars) are ancient, more than 10 billion years old, and so they provide clues about the environments from which they originated. Most important, these stars vary in brightness. In studying the period of this variation, Cseresnjes found a significant similarity in the distribution of 2,000 RR Lyrae stars with similar periods in both SagDEG and the LMC (Patrick Cseresnjes, 2001; and Cseresnjes et al, 2000). Variable stars in these two satellite galaxies are not so similar to those in other neighboring galaxies. The similarity between SagDEG and the LMC is not restricted to RR Lyrae stars. It has also been observed through other stellar populations like Carbon stars (Whitelock et al, 1999) and Red Giant Branch stars (Andrew A. Cole, 2001). These similarities strongly suggest that both galaxies have similar stellar populations. 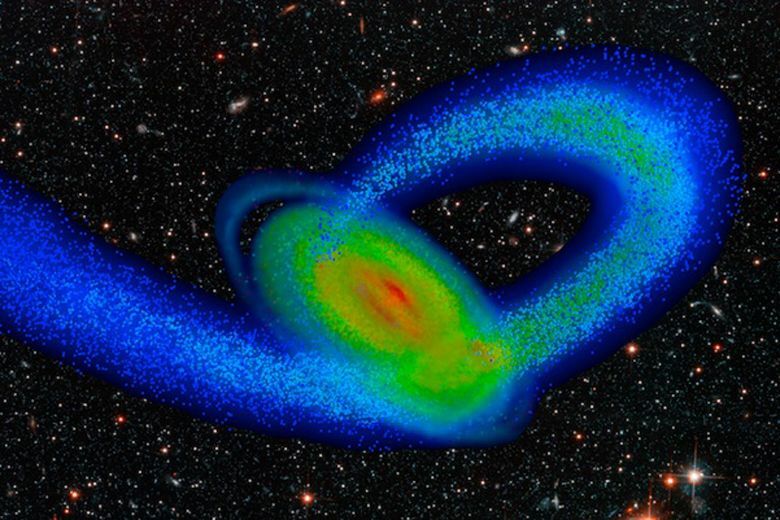 Although SagDEG and the LMC could have been part of a larger galaxy which broke up into several pieces after colliding with the Milky Way, it's unclear how such a collision could leave the two galaxies in their present configuration, where the orbital plane of one is perpendicular to that of the other. 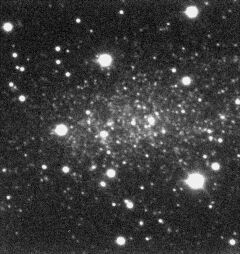 Moreover, numerical simulations indicate that a dwarf spheroidal galaxy can not survive more than a couple of billion years on a low orbit around the Milky Way, unless SagDEG's progenitor is assumed to have a higher concentration of mass than is consistent with observations. While the hypothesis is in conflict with the substantial number of RR Lyrae stars observed, it could be resolved if SagDEG was actually formed of "debris" pulled out of the LMC after a collision and has been injected on its present orbit only recently. Possible configurations involve a collision between the LMC and the Galaxy or the Small Magellanic Cloud. According to Cseresnjes's research team, however, such scenarios raise additional questions, such as: when did the collision occur; what happened to the gas; how can the present orbital planes of SagDEG and the LMC seem to be perpendicular to each other? (More discussion from l'Observatoire de Paris). More information and images of SagDEG may be available at NASA and IPAC's Extragalactic Database. See slides and audio from the March 14, 2000 conference on Galaxy Formation and Evolution and Professor Rosemary F.G. Wyse's presentation on "Observed Components of the Local Group" and her paper on "The Merging History of the Milky Way Disk." Up-to-date technical summaries on the Sagittarius dwarf galaxy may be available at: NASA's ADS Abstract Service for the Astrophysics Data System; the SIMBAD Astronomical Database mirrored from CDS, which may require an account to access; and the NSF-funded, arXiv.org Physics e-Print archive's search interface. Sagittarius is Latin for "archer," often represented as a centaur wielding a bow and arrow since ancient times. The constellation also contains the Great Sagittarius Star Cloud, where a vast milky swarm of millions of stars mark the way to the center of the galaxy. For more information about the stars and objects in this constellation and an illustration, go to Christine Kronberg's Sagittarius. For another illustration, see David Haworth's Sagittarius. © 2003 Sol Company. All Rights Reserved.